Home » Rebecca Skloot » A Pop Health Book Review of "The Immortal Life of Henrietta Lacks"
A Pop Health Book Review of "The Immortal Life of Henrietta Lacks"
This book is not brand new; it has been out for about a year. However, it continues to pick up momentum and be read by book clubs across the country. Therefore, after it was recommended to me by my mother-in-law, I thought it would be perfect for a Pop Health Book Review. As someone who works in public health, I collaborate with our University's Institutional Review Board (IRB) on a daily basis to ensure the safety of our research (for the good of our research team, funder, and participants). And even though I know and understand the importance of the collaboration, it can still feel like a burden to address and document each question that is asked by our IRB (I know many of you would agree!) I see the students I work with roll their eyes and sigh when they have to take the IRB and HIPAA trainings. HIPAA stands for Health Insurance Portability and Accountability Act of 1996 Privacy and Security Rules. The students say, "Yeah...we already know this stuff". However, this book takes what you "already know" and puts a face on it. It reminds you that it wasn't long ago that people (especially vulnerable people) were experimented on and/or used for research without their consent. Often with sad and deadly outcomes. Rebecca Skloot, an award-winning science writer, takes the reader on her personal journey (lasting over a decade) to learn about the woman behind HeLa cells. The woman's name was Henrietta Lacks. The original cells were taken from her cervix shortly after she was diagnosed with cancer and before her death. HeLa cells have been vital for many scientific advances, including the development of the polio vaccine. Henrietta Lacks was a poor Southern tobacco farmer, seeking medical care from Johns Hopkins "colored" ward in the early 1950s. A sample of her tumor was taken and given to researchers without her consent. She was treated with radiation without a discussion about the side effects. Henrietta had no idea the radiation would cause her to be infertile. The hospital convinced her husband David to agree to an autopsy (after he already refused) by saying that the exam "could help his children one day". The autopsy results were later given to a writer who published all the details in his book. It is no wonder that the IRB now requires specific training and attention to address research that focuses on vulnerable populations. These include pregnant women, fetuses, neonates, prisoners, children, and other special classes of individuals such as minorities and those that are mentally ill. It is no wonder that it can be incredibly difficult to recruit members of these vulnerable groups to participate in research, even today! Henrietta's family spoke of their fears of being snatched off the streets around Johns Hopkins by doctors wanting to experiment on them. Rebecca found research that tales of "night doctors" had filled black oral history since the 1800s. These doctors would kidnap black people for research. This book examines the ethical issues of sharing human tissue. Consent to share human tissue (e.g., those you have "discarded"after a blood test or biopsy), is not the same as consenting to participate in research. Often consent is not required. But do researchers and doctors have an ethical responsibility to disclose to the patient if (1) their cells/tissues are unique and valuable in some way, (2) the researcher or doctor has a financial interest in their tissue, (3) the patient's tissue will be used in any way that is contrary to their beliefs? Times have certainly changed since 1951 when Henrietta Lacks was subjected to tests and procedures without giving informed consent. Unfortunately, it took about 50 years to get there. Her husband and children were still left in the dark regarding the purpose of blood tests in the years after her death. Scientists wanted to map their genes. The family thought they were being tested for cancer. They waited years for results that never came. Most of Henrietta's family only completed school until their early-mid teenage years. Even when the doctors explained parts of procedures, it was not at a level or in a way that was familiar to them. This book emphasizes the importance of being "informed" in the consent process. If the participants don't understand, their verbal or written consent means nothing. All of these important issues are discussed with beautiful storytelling by Henrietta's family and Rebecca's careful research. It is a must read, especially for my fellow science and public health friends out there. You'll find yourself cheering for Henrietta's daughter Deborah and her siblings, who have all endured more than their share of suffering. And probably most important, you'll find yourself making a pact to never sigh when it is time to complete the annual IRB training. 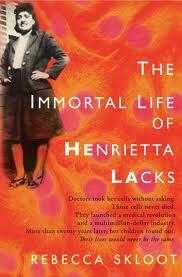 Related Posts : A Pop Health Book Review of "The Immortal Life of Henrietta Lacks"